Jane Powell has devoted a large part of her life to two very different universes, both of which are based on gender identity - Greenham Common where women chose a different way of life, and the campaign against living miserably (CALM), aimed at bringing the suicide rate down among young men. Jane launched CALM as a pilot for the UK's Department of Health in Manchester in 1997, and returned to launch it as a charity in 2006. RB: Jane - a recent blog I wrote about Greenham Common received noticeably fewer hits than other parts of the discussion: why do you think there is so little interest in that historic experiment? JP: All of us who were there have quite deliberately avoided making media capital out of that fact - and this has no doubt contributed to the lack of profile. But it has meant that Greenham has become invisible. People who subsequently lived in trees or are part of the Plane Stupid campaign make deliberate use of the media, and the difference shows. We felt that it was wrong to exploit what we did for the sake of media coverage: the whole culture of the camp was about an anarchy that rejected leadership hierarchies, spokespeople and a nice table for press enquiries. Greenham was the reverse of that. We made decisions based on current circumstances. We didn't stick to one set of rules. Everybody was listened to and had a right to ‘be', provided it didn't interfere with others. It was anti-authoritarian and very affirmative of the people living there. Books written about Greenham, such as On the Perimeter, are hilarious because they so totally missed what made the place so brilliant. RB: So, what was so important about the experience for the women involved? JP: It allowed women to really be who they were. It brought together women of very different backgrounds and classes and ages - working class women together with women who had been in powerful positions, civil servants for example, women working in health or social welfare, miners' wives, kids from the local schools, young vulnerable women. I remember the circulation of a Molesworth newsletter which said: ‘This is how you get over the fence. You dress in dark and sensible clothes. You go over in the middle of the night. You get a piece of carpet for the barbed wire and make sure that you're all prepared...' It was funny to read because we had just led a completely impractically dressed cross-section of women into the base in the middle of the day. One of them was wearing a very long floaty gown and another needed to be helped because she was extremely old and infirm - and actually it was much more fun doing that than pretending to be in the army and attacking the fence as if you were a soldier. It was more open, more chaotic certainly, more sociable, and far more powerful. There always were very strong women there, so there were constant arguments, some of them very bitter. It wasn't an easy place to be. But the fact that Camp couldn't be ‘cleaned up' by somebody taking over and telling everyone else how to behave - that was what was so fantastic. JP: Yes, the other thing about it which is even less talked about is the fact that women were not just coming together to talk about cruise missiles - but this fantastic mix of people all out of their different boxes were talking about peace and society in a far broader manner - poverty, sexuality, the environment, nuclear testing, food mountains, in a way that was and felt innovative. We could do this because we weren't centrally organised and everyone did their own thing. And as such it was very hard for the authorities to tackle. They couldn't cut off the head. If they arrested one woman, we wouldn't all just go away. RB: What could they do, for example, about women hanging pretty things on the fence...? JP: I must confess I didn't much like the resulting litter trail, but I guess it was symbolic! They could evict us. They could take away all of our stuff and they could imprison us. Prison never worked very well because it gave us too much publicity. But the evictions were nasty, very gruelling. You would suddenly lose all your food and shelter. But other women would arrive at camp, with some food, or hot food, or plastic, or a pram - always a very good thing - or a sofa. And the camps suddenly sprang back to life as if by magic. Non-violence was essential. The business about enforcing your will on somebody else - which is what violence is - was a non-starter. So at camp meetings - which were legendary - we would go round and round and round the circle and give everybody space to say what they thought until there was a collective decision. The anarchy and the non-violence were core components for the women involved and in a way were the same thing. RB: So after having your own family, how did you end up in the Campaign Against Living Miserably (CALM)? JP: I was asked to launch CALM by the Department of Health. The suicide rate for young men was climbing, and most of those suicides were committed by young men who were not accessing any kind of help. The idea was to create a helpline which young men would identify with, and a service which be useful to them. I was asked to go to Manchester, an area where the suicide rate was highest at the time, and to use music and/or sports (neither of which I knew anything about) to brand the campaign and reach young men (another area about which I knew nothing). The idea of the project was to provide callers with support and practical advice and information. Not just a listening service. The point was to brand it in a way which would reach our audience. The suicide of young men at that point had never crossed my radar, and I confess I dreaded the challenge. But I became totally engaged when I started to get involved. I didn't have to work hard persuading people to get on board. Radio stations, djs, clubowners, and miscellaneous young men responded easily, positively and with real pleasure to the idea of getting involved, and took an active part in the campaign. Which was amazing and inspiring. And a rare treat. The other reason I became particularly interested was that when I looked at the suicide rates and how they were changing, I realised it wasn't just about Manchester. Young male suicide was a global phenomenon. There is a pattern to it that started in the seventies, when the suicide rate starts shooting up, and continues until the late 90s. In the 30 and 40 age group it is still rising now. And regardless of age, depressed men tend not to talk to anyone. Moreover, they are three-four times more likely to kill themselves than are young women. Unlike young men, young women will talk about their problems to families, strangers, friends. Where you have countries at war or with particular political and social instability, as in some parts of Eastern Europe, the suicide rate is particularly high in young men. But what struck me was that almost every single country in the world is significantly affected by this pattern of young male suicide. So why? Each country has its own response, and everything that can be measured is - levels of poverty, obesity, crime, diet, hospital care etc. What can't be measured so easily is cultural change, social attitudes, changes in gender, the media. And here there have been profound changes since the 70s, when young male suicide rates started to rise. What appears to be the case is that many young men simply don't feel able to live up to our, or their, expectations. So this issue isn't just about Bridgend, or even suicide in Britain. I believe it is about gender. RB: Since the seventies, you think men have had a worse time of it? JP: It has been a period of monumental change. And the fact is that if so many more young men commit suicide than young women across the world over the same period of time, you cannot get away from the fact that this is something to do with what it is to be a man in this period of time - in the last forty years. Talk to people engaged in this campaign or to the parents of suicides and the impression you get is that it is hard being the kind of man you are expected to be, and very hard coping with not reaching that goal. I don't think you can look at the suicide curve during that period without thinking that this is something to do with changes happening to gender relations within society at the same time. RB: Do you find yourself agreeing with the Pope's end-of-year message for 2008, therefore, on the need to defend gender roles as God designed them for the human species? JP: Not at all. This isn't about abandoning equality for women. With my dying breath I would not advocate that, any more than bringing back slavery - the abolition of which also caused a lot of upheaval. Moreover, cutting seems to have ballooned in both sexes. (Again, a lot of the boys won't go and see their GPs or anyone else.) And I agree that there are still huge problems involved in growing up as a young woman as we see in eating disorders and indeed suicide attempts. But if we are going to have an impact on the suicide rate in young men - it seems to me that we have to recognise the existence of an identity crisis in being a young guy. If you take on board the bigger picture, then you see that the male suicide rate has gone up as the position of women has changed alongside rapid changes in technology and the media. Young men don't feel able to fulfil either their own expectations or ours, and since they are not supposed to talk about how they feel - or access any kind of help - their frustrations take different forms - drink, violence and suicide. We need to tackle these. There needs to be a discussion, and we need to look at where the problems are and what is going wrong. RB: It is not a simple picture, is it? You might think women have liberated themselves rather successfully, if very unevenly, in some ways: men just have to catch up. But the first complication is that we are dealing here with a relationship of fundamental inequality between those two stereotypes. Changes to one side of the gender equation necessarily have an intimate impact on the other, not least at the level of power. JP: There is the gender backlash. There are elements of society who have dug themselves into entrenched positions and refused to engage in any sort of dialogue about what it means to be a guy or a woman. And the media have demonised men trying to talk about issues in the same way that they demonised feminists. That has been fantastically detrimental, that self-imposed entrenchment. And the result is that it leaves a lot of young men in particular without any way to turn. These are the ones who don't want to be the strong silent caveman types, but who see women having it every way they want. JP: The changes in mass communication and media had a huge impact in the 70s and the 80s - offering people completely different types of roles. But these things are very muddling for all concerned. It's relatively recent that men beating up their wives became socially unacceptable. You can't do it any more. Yet, switch on the tv and it's full of men being violent towards women. And whilst we are all meant to be in favour of equality of opportunity - there is still the social expectation that a real man will earn more than his girlfriend or wife, and not be found at the sandpit with his kids during the week. RB: Of course we are told that the media can only reflect what young people want and who they are out there: take the business about Sachsgate: that was the excuse. On the whole, the impression we are given is of an inexorable process of brutalisation. JP: It's a huge problem. Young guys are surrounded by images of who they are not and who they don't want to be. How are they going to keep their women if they don't feel able to be like the guy in the advert? And often the portrayal of young men in the media is a degrading caricature. The women are smart, pretty and career-oriented and the young man is just a dork, an unresponsive lump. But our campaign proves that this isn't what young men are like today, and it's not what they want. Peer group pressure in your late teens when you are most insecure is horrendous. If you look into the suicide instances, quite often it is very nice, sensitive, decent types who suspect that they are never going to fit in - a little too different from the prevailing macho model, and bullied as a result. Bullying, of course, has always gone on at some level, only now it has been turned into a feature of celebrity life /reality tv. With those who are being bullied hoping for their five minutes of fame. The one thing that is not discussed is the nature of masculinity. And women have to be involved in that debate. Not in an accusatory way. Both sides need to unpick the gender relationship and look more closely at some of its versions and component parts, together. There are assumptions and problems on both sides. Until we have that discussion, I'm convinced that the suicide rate isn't going to change. JP: I am nothing less than inspired by the way that 15 to 25 yr. olds love this campaign, and get involved in it. That's what makes this an exciting campaign, the very real desire - a vehement desire for change. With a constant stream of emails saying "I'm please to see the website there. It's really important that you continue." "It's good to have somewhere to talk without being judged." And the guys in their 30s and 40s want to get involved too, and give a hand up to the younger ones. You can hear the sigh of relief across the board that this is something which says it's there for them, it's OK to be a guy and there's no judgement or expectation about who you should be. Pretty similar to the relief I felt at having the space to be myself at Greenham. So for me, this is a continuum. 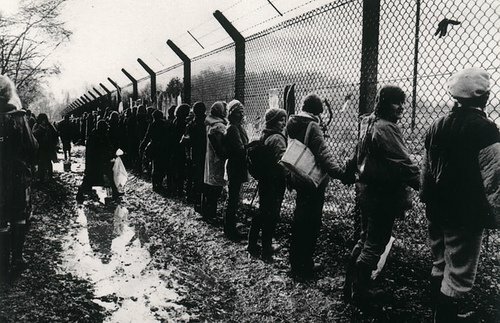 If you go back to Greenham the core elements were anarchy and diversity, and non-violence. The diversity of interests and mutual acceptance of the women at camp - interested in the environment, nurturing, lesbianism, the military, sharing a central set of beliefs in non-violence - this is what made the campaign so strong. CALM supporters range across the social and life experience spectrum. Some have experienced the kind of bullying I was talking about: many not at all. They range in age from 9 to middle age: from kids in care to city men in suits. But they're coming together around the desire to find a space defined by and for themselves. RB: What has worked best? JP: The CALM website, it was decided from the beginning, would not be a site created by health professionals paid to provide a service to young men. CALM is of and about young men. This is absolutely central to the campaign. But it isn't prescriptive. Look at Nuts or Loaded and you will see that they both have quite a conformist agenda of who you ought to want to be. Inevitably, the CALM website is quite messy and chaotic. The language is very important: it is not about victimisation. It isn't at all like those awful images of young men holding their heads in despair. Our website is much more upbeat because our audience blanks out these kinds of messages: they want to be positive. There are some gems in terms of videos and articles - but it isn't dogmatic or judgmental. Our ads - the Save The Male, Gulf war and the Union Jack ads - have been created by young men, and they respond very positively to those ads. I get constant e-mails from men who want a piece of CALM, who want to be a creative part of it, want to be involved. The push is from below. It has amazed me. It is that set of beliefs and values that we have tried to keep alive in our branding of the campaign. Music is very important to CALM, and music/ entertainment/humour is the environment within which it sits. Core to the campaign is the idea of overturning the notion that the strong and silent type is anything to aim for. Being silent is being a victim. So, ‘Being silent isn't being strong' is our core message. And we use music and young mens' peers to communicate that message. Take the Beatbox Ad: this has had a really strong response. Real people, djs, artists, musicians, talking about stuff. A great ad. As a result, it is a positive campaign concerning gender and aspirations, diversity and creating a space for men to exist and feel good about who they are. CALM, like Greenham, is a dynamic, lived campaign fuelled from below, by men from an incredibly diverse range of ages and backgrounds who are creative and want to be involved and engaged with what we do next. Yes - it feels like home.